We’re ready to help you celebrate one of springtime’s hottest traditions – the 2017 Philadelphia Flower Show! 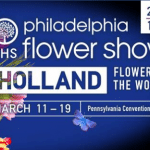 This year’s show promises to be an explosion of color and smells, with this year’s theme of Holland: Flowering the World. Besides the stunning floral displays, attendees will enjoy educational sessions, culinary demonstrations and exceptional shopping! Other special attractions within the show include the Garden Spa and Garden Tea – separate tickets must be purchased for those. We’re offering our annual day trips to the show on opening weekend March 11 and 12 as well as Wednesday March 15! Cost is $65 per person and includes admission to the show. Enter to win our package that includes 2 tickets to the show and round-trip transportation on any of our day trips! No purchase necessary, simply fill out the info below and sign up for our weekly e-blasts! Entries close at noon on Jan. 18.